jumping on the tip of the abdomen on the left. Much of Minnesota has experienced consistent rains through the spring and summer this year. This has led to an increase in the numbers of springtails in and around homes and other buildings. Springtails love damp conditions and are typically found in soil, leaf litter, lichen, under bark, decaying plant matter, and other areas of high moisture. Given an opportunity, they will also inhabit your home. These tiny insects are wingless and cannot fly but they can jump. They use a forked appendage called a furcula (located underneath the abdomen) to propel itself. When not in use, a furcula is tucked up under the body, set like a mouse trap. When it is released, it extends down rapidly sending the springtail forward. A springtail can jump many times its body length. Why are they found in homes? 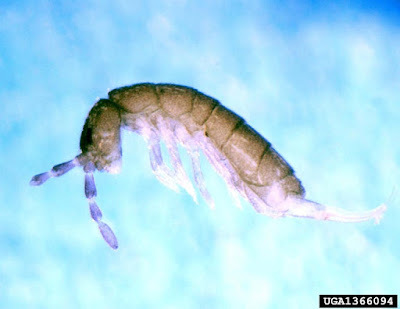 Springtails can be found indoors for several reasons. You can find them in areas of high moisture, e.g. around plumbing leaks and damp basements. They can also move indoors in large numbers from the outside when moist conditions exit around the home. Springtails can vary in abundance indoors from just a handful to very large numbers. Fortunately, regardless of their numbers, they are harmless to people and property and are just nuisances. How can I control springtails? If you are finding just a small number of springtails occasionally, just ignore them or physically remove them by hand or with vacuum. However, if you are seeing persistent number of springtails they are associated with a moisture problem. The best management is to dry out these areas with a fan or dehumidifier as springtails do not tolerate dry conditions. Also make any structural changes to correct the moisture problem. Peoplewithout moisture problems might still encounter springtails. If they are moving in from the outside, check around the house for damp conditions. This could include rainspouts that do not carry the water far enough away from the foundation, landscapes that slope towards buildings, or excessive irrigation. It could even be a moisture problem with the roof or the gutters. Correct moisture conditions to help decrease springtails. As we receive less rainfall, the number of springtails will also naturally go down. Although it may be tempting to spray a springtail problem with an insecticide, the products available are not very effective against them. Moisture control is the most effective strategy. For more information see Springtails.